The fixtures scheduled to be played this weekend are all South of Scotland League matches with Mid-Annandale and Lochar Thistle locking horns at Lockerbie on Friday evening with a 7.30pm kick-off. This could be a very close encounter with home advantage probably being the deciding factor along with Mids latest young scoring sensation Denver Milligan. The top match on Saturday looks like being at Hamilton where Edusport Academy play hosts to Wigtown and Bladnoch. 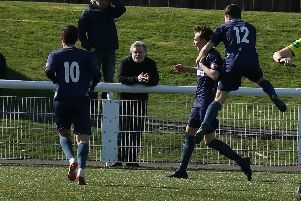 This could be a key match in the Trammondford Park’s retention of the South of Scotland League title although as always much depends on what players Edu put on the park as they maintain their rotation system. Heston Rovers entertain Creetown at Palmerston Park for a contest that could go close although with home advantage Heston will be favourites to claim the three points. Newton Stewart and Fleet Star lock horns at Blairmount Park for a match the Creesiders will be keen to win to maintain their challenge at the top although they will not find it esay against a stubborn Star team who are more than capable of springing a surprise result. Present league leaders St Cuthbert Wanderers are expected to increase their goal difference after their match against basement side Dumfries YMCA.